Most people look for healing “from something” or they want to “get rid of” or “fix” something that feels uncomfortable physically, mentally, or emotionally, without much contemplation of what healing truly means. True healing is not about ‘fixing’ or suppressing symptoms of physical or psychological ailments, nor it is about replacing negative beliefs with positive ones. True healing is a state of dis-identifying from the mind and emotions and becoming aware of how beliefs, desires, and conditionings cause pain and suffering. True healing is about becoming aware of the causes of pain and suffering, learning the needed life-lessons, and transforming the ego-mind into self-empowered consciousness. To heal, means to let go of attachments to ideologies and the need for control and approval. To heal means to transform pain and suffering and achieve a state of inner balance and peace. It means to transcend the fear of death and the unknown and find the eternal presence of the Inner Being. The Dalian Method is not only an advanced technique for healing the body, mind, and emotions but it is also a one-of-a-kind tool to accelerate spiritual awakening. The Dalian Method acts as a bridge between the teachings of the awakened masters and you experiencing the truth of those teachings for yourself. By using the Dalian Method as a spiritual practice, you will dramatically increase your ability to witness and dis-identify from your thoughts and emotions, deepen your self-awareness, strengthen your intuition, expand your consciousness, and connect to your inner wisdom and life purpose. Many unexpressed layers of thoughts, emotions, beliefs, and conditionings are repressed in the body and its cellular memory. They run as invisible programs blocking the free flow of energy through the body and causing pain and disease. Our beliefs are based on socio-political and religious conditionings and the conclusions we make from our life experiences. To eradicate pain and illness we must access and work with the causes of ailments instead of their symptoms. All answers are within. Consciousness within the Being is the master key that can permanently dismantle the unconscious beliefs and conditionings and liberate the soul from the story created by the ego-mind. Consciousness must be grounded in the entire body in order to achieve complete and lasting healing and transformation. 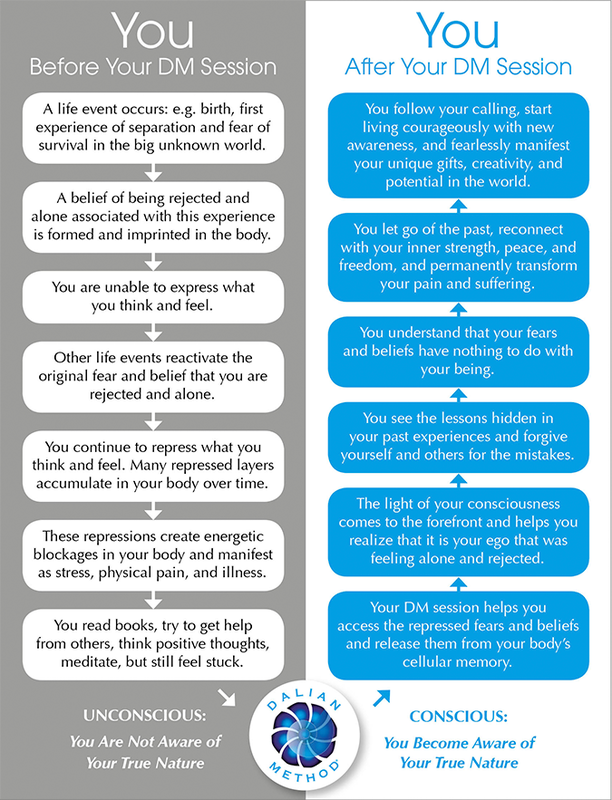 The Dalian Method works with the key principle that the healing of the body, mind, and spirit are a by-product of transformation from unconsciousness into consciousness. It spontaneously uncovers the original state of purity and innocence of the being, before it was programmed with layers of beliefs and conditionings. This naturally facilitates inner transformation and effortlessly results in the healing of the body and restoration of the damaged DNA into its natural form. Most commonly practiced body-oriented (allopathic medicine, acupuncture, and different types of bodywork), mind-oriented (psychology, psychiatry, and counselling), and spirit-oriented (faith, shamanic, and psychic) healing systems, though helpful and necessary in improving human conditions, they primarily treat the symptoms of ailments instead of their causes. The Dalian Method™ (DM) focuses on treating the causes of the physical and psychological ailments. It ensures that the causes have been permanently eliminated and transformed in the body, mind, and spirit as a whole. The Dalian Method helps you find all the answers within your own being and understand that your being is always healthy and whole, and it can never die. Working with the Dalian Method helps you truly understand that all your problems have been there to help you learn important life lessons and find the peace, silence, and abundant joy and creative possibilities hidden within your own being. Through the process of healing into consciousness with the Dalian Method you experience your inner clarity and strength and realize that no one can prevent you from living your life freely and according to your own inner truth and calling. You relax into yourself and become more accepting of yourself and others. You let go of the past hurtful memories, insecurity, blame, and anger and free your energy from fear, judgments, and self-imposed beliefs. You learn how to find the answers within yourself, begin to take charge of your own life, and become excited about what life has in store for you. “Healing of the human body might be called a growth in consciousness. Most experts agree about the need of becoming conscious to solve our problems, but offer limited solutions based on the same mind that creates the problems in the first place. Using the cognitive mind to solve problems offers surface solutions because the unconscious beliefs and conditionings still remain in the body’s cellular memory and run like invisible computer programs. As we all know, we cannot change a computer program with wishful thinking and achieve the desired results. In order for healing to be permanent, consciousness needs to be fully grounded in the entire body. After having transformed the unconscious thought patterns and beliefs into consciousness, the Dalian Method solidly grounds the newly gained clarity and understanding in the entire body, from head to feet. Consequently, the light of consciousness erases the causes of fear and self-sabotaging beliefs created by the ego-mind, and therefore permanently heals pain, anxiety, and dis-ease. Fully grounded consciousness in the body helps us find and live our inner purpose without compromise. This unique system by-passes the mind and helps to effortlessly bring to the surface the precise thought patterns and emotions that have been imprinted in the body and energy for years and even lifetimes. Mathematically and systematically, the Dalian Method works through the entire body (from feet to head) to release and dissolve the unconscious thought patterns, emotions, and beliefs that cause energetic blockages, psychological unrest, and disease. Working with the entire body, including the chakra system, Yin/Yang (female/male) energy polarities, the breath, and out loud verbal expression, the Dalian Method helps to permanently transform the underlying causes of identification with fear, self-doubt, jealousy, anger, insecurity, chronic pain, and disease. As the body detoxifies from layers of repressed negative emotions and belief patterns, your inner consciousness spontaneously comes to the forefront and helps you dis-identify from your chattering mind and its beliefs. With the self-sabotaging thought patterns and emotions released from the body, your energy begins to freely move again, and you naturally connect with your inner joy and stillness. The energy movement naturally opens the neuropathways in the body, spontaneously awakening the body’s ability to restore the health of the organs and heal itself. Feeling an overall state of wellbeing, spontaneously and without the need of positive thinking, the heart opens and frees the tremendous power it contains to heal the past wounds, learn the needed lessons, and authentically forgive oneself and others. Utilizing the innate wisdom the third eye (the sixth chakra), the Dalian Method brings you to a place of deeper understand to why things happened the way they did. It helps to transform anxiety, fear, blame, and negative emotions on a cellular level in the entire body. Self-acceptance, love, compassion, and gratitude arise naturally without using any affirmations. You experience the silent presence of your being and realize that you have the strength and power to live your life as you choose. You forgive yourself and others for all the mistakes and open to new possibilities that life is waiting to offer you. And once again, all these things are achieved through a Dalian Method session without using the cognitive mind! After the release of Healing the Body & Awakening Consciousness with the Dalian Method: An Advanced Self-Healing System for a New Humanity home practice set Mada offers only a limited number of private sessions.For testimonials click here. For booking information please refer to book your session page.